Nicole's Needlework: Ruth Bacheler Finished! I finally have a stitching finish to share! I started Ruth way back in 2009. I actually started it three different times until I was happy with the colors. I'm so glad I got back to it and got it finished! The Scarlet Letter "Ruth Bacheler 1717"
The called for color is on the left (next to the symbol), the color I used is on the right. The initials in the parenthesis are used for the Irish stitch points and Bargello. Wowzers! Ruth is a STUNNER! Congrats on the great finish, Nicole! And just how did you know I was going to ask you about your conversion? ;o) Lovely lovely sampler! Well done. It is amazing. Well done Nicole! I think I need to add this to my stash after seeing yours. Love it! So beautiful! Congrats on the finish! I so need to get back to this one. the colours really pop! Beautiful, Congratulations. Gorgeous, gorgeous, gorgeous! Love your color choices. Beautiful work lady. Oh wow!!!! I got to see this work of art in person, and it is stunning!!!! Put it in the framing pile..... You have many new walls to fill! Such a wonderful finish! I love your colour choice! So very beautiful :) Congratulations! 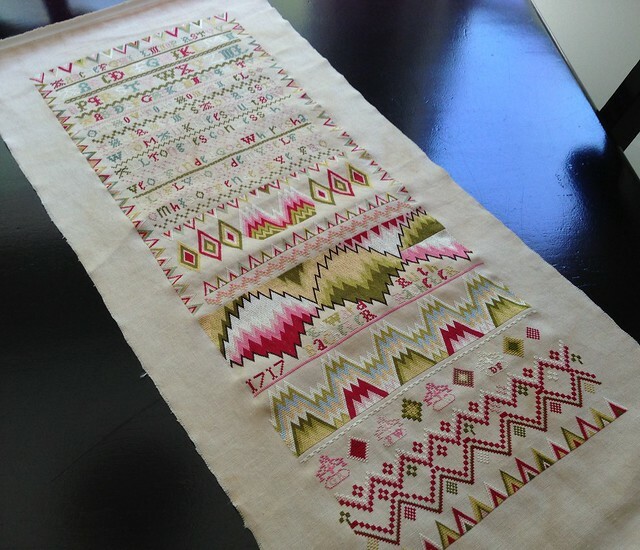 Beautiful sampler, Nicole. The colors are spectacular. It's a wonderful piece to hang in your new home...Congratulations! Love this finish ~ great colors!!! Completely gorgeous!!!!!! Makes me want to get mine back out :-). And of course I don't mind sharing :-)!!!!!!!! This is one gorgeous piece! I know you will want it framed and up in your new house SOON! Love it! Spectacular finish Nicole! Ruthie is gorgeous! One of the most gorgeous samplers ever!!! Congrats!!! Congratulations on finishing Ruth. Thanks for sharing the conversion it looks great. Woohoo! She's finished! Well worth the wait while you worked out the colors. She is beautiful and will look great hanging on one of the walls in your new home! Stunning finish, Nicole! I can't wait to see how you frame her! She is a stunner. Some day I hope to stitch her. Fantastic! It doesn't look stitched at all. looks like a painting, such is the neatness of all those stitches. Congratulations on a a wonderful finish. Congratulations! This is such a fabulous piece. I love the banners. Congratulations - she's a beauty!